Christine helps ensure that at Linden, healthy meals and snacks are the norm. Linden has a binder full of recipes lovingly compiled over time from magazines, newspapers and hand-written notes. “We have developed our favorite menus with a lot of trial and error,” said residential advisor Christine Escribano. Here is one of her favorites that is popular with Linden residents. 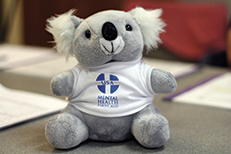 ALGEE is the mascot bear of Mental Health First Aid. Mental Health First Aid (MHFA) is a public education program that introduces trainees to risk factors and warning signs of mental illness, builds understanding of their impact, and overviews common supports. The course uses role-playing and simulations to demonstrate how to offer initial help in a mental health crisis and connect persons to the appropriate care. Mental Health First Aid teaches a five-step action plan (ALGEE) to offer initial help to people with the signs and symptoms of a mental illness or who are in a crisis. Anyone can take the eight-hour course. For more information contact ADAMHS of Montgomery County. Housing First Tenants of the Year Belvo: Kailonia J.
Tina A., William B., Michael B., Michael B., Angela B., Jonathan C., Erik E., LaShanda F., Marie G., Krishna H., Ronnie H., Tiffany H., John H., Amy K., Anthony L., Sandra L., Robert M., Nicole M.-A., Anita M., Glenda N., Nina P., Andrea P., Mark P., Kim R., Debra S., Jim S., David S., William VN., Stephanie W.
Advisors and aides are critical to the successful operation of PLACES adult care facilities (ACF). Meet two staff members who create a family-like environment at Linden. When you are diagnosed with severe and persistent mental illness, finding a safe, family-like environment for long term care is a challenge. Many people with bipolar or schizoaffective disorder or undifferentiated schizophrenia wind up on the streets or seeking space in a shelter where they may have to arrive by 3 p.m. in order to be allotted a bed for the night, then be required to leave by 8 a.m. the next morning. At Linden, the largest ACF that PLACES operates, 12 residents ages 32 to 65 have a comfortable, secure place to live in a neighborhood setting. They are free to leave the premises, and several hold jobs in a sheltered workshop four days a week. Making it all hum as smoothly as possible are three full-time advisors and two aides. Christine Escribano is an advisor who has worked at Linden for the past 11 years on the 8 a.m. to 6 p.m. shift. 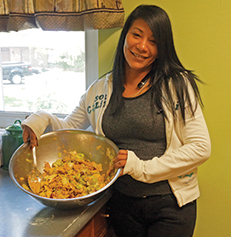 Her job is spending time with residents day-to-day, reminding them to take their medications, taking them to doctor’s appointments, shopping with them to select healthy snacks, and preparing wholesome lunches and dinners each day from scratch. Christine moved here from Boston, where she was a CNA and a job coach at a developmental disabilities organization. “I loved being in human services,” she said. She encountered PLACES at a job fair in 2005 and has been at Linden ever since. While aides work the overnight shift, advisors like Christine are with the residents all day long. “We have an Activity Board that plans special trips to places like the Cincinnati Zoo or Dave & Busters,” Christine said. “Winter is a time for arts and crafts because it’s harder to go out. Three of our 12 residents are really into the arts, but everyone enjoyed making tie-dyed shirts.” These kinds of activities are therapeutic and help pass the time. Julie spent 3 years with PLACES from 1996-99, then left to become a case worker, returning in 2007. She knew the administrative staff and was happy to rejoin some of the same residents she had missed. “I wouldn’t trade it for anything,” she said. PLACES currently has a number of openings for full-time, part-time and on-call staff. Qualified jobseekers may go online to learn more. Openings are posted on this website, GreaterDaytonWorks.com and other local websites. Mental Health First Aid has grown to be an international movement. 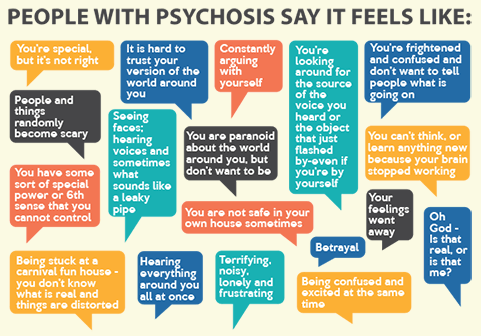 Since 2008 more than 550,000 people have been trained in the U.S.
For fact sheets on Life with Psychosis and Life with Bipolar click here. For more than 65 years, May has been designated as Mental Health Month, a time to raise awareness of this important public health issue. While many PLACES staff members have dedicated their careers to supporting clients with mental health problems, they took an additional step this spring with “first aid” training that allows them to identify emergent illnesses or imminent crises in the community or workplace. The Alcohol, Drug Addiction and Mental Health Services board of Montgomery County (ADAMHS) is providing two-day training sessions to PLACES staff, including caregivers, counselors and administrators. Their certifications are valid for three years. The training was provided as part of a new partnership that began in March between PLACES and ADAMHS on the East Dayton AWARE Project, which trains people in Mental Health First Aid in the 45403 and 45410 ZIP codes. Youth targeted in these ZIP codes made twice as many hospital ER visits as the entire county. Overall, heroin overdoses were three times higher in these areas. In exchange for training, PLACES provides useful feedback to ADAMHS staff and has an employee participate on their advisory board. Mental Health First Aid was launched in the U.S. in 2006 and has since received the support of Congress and First Lady Michelle Obama. “The course gives people the skills to help a family member struggling with addiction, the knowledge to talk to a co-worker suffering from depression, and the confidence to intervene with a friend contemplating suicide,” according to Linda Rosenberg, President and CEO of the National Council for Behavioral Health. The newest member of the caregiving team at Belvo House is a four-legged “therapist” named Louie Von Goldendoodle. He makes 30-minute “house calls” each month to the eight clients of this Permanent Supportive Housing facility. 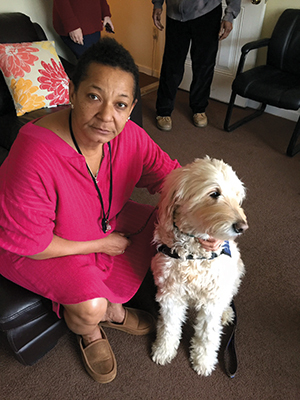 Louie Von Goldendoodle, a trained master therapy dog, visits Housing First tenants at Belvo monthly to brighten their day. Louie is a six-year-old Golden Retriever and Poodle mix owned by Debbie Boomershine, a volunteer with the Miami Valley Pet Therapy Association. Specially trained to visit hospitals, nursing homes and other care facilities, Louie started making visits to Belvo at the beginning of this year. “Several of our clients love pets, but are not able to keep them here,” said Belvo case manager Sara Beal. “I was discussing their request with Shannon [Root] and Tracey [Jones], and we came up with the idea of contacting Miami Valley Pet Therapy. I chose Louie because he appeared calm. In fact, he does a great job of calming one of our clients who exhibits manic behavior. Debbie has told me about a non-verbal nursing home patient he visits who speaks only to him. Louie was featured in the “Unsung Heroes” column of the Dayton Daily News in December 2015. He is one of 125 certified pet therapy teams that MVPTA offers to 95 hospitals, nursing homes, assisted living facilities, libraries, rehab centers and other residential programs in a six county area. Teams consist of a human volunteer and their dog, cat, rabbit or other hand-held pet. For more information or to volunteer, contact www.mvpta.com or 937-286-0028. PLACES is proud of its clients, tenants and residents who have worked hard to achieve their goals in education, vocational training, community service and recovery. Here are some who recently received awards. 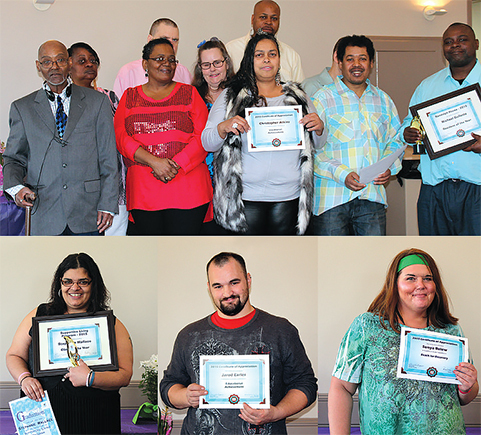 Top: Group of clients and tenants celebrating their Vocational Achievement awards. Below, left to right: Stephanie W. graduated from the Supportive Living Program, where she was also named Client of the Year. Jarod E. earned the Educational Achievement of the Year award. Sonya B., a client of the Supportive Living Program, received this year’s Reach for Recovery Award. 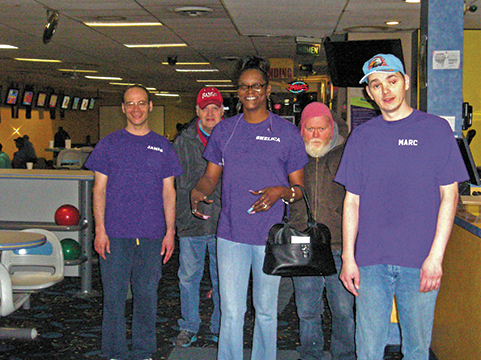 Capri Lanes in Dayton was a fun place for ACF residents this winter, as they bowled in a weekly league that took over 12 alleys on Thursday afternoons, culminating in a banquet in early May.